Traveling is all about having new experiences, so when my sister-in-law visited us in Playa del Carmen, we had a slew of new things for her to try, such as swimming in cenotes, skydiving and visiting ancient ruins. Little did we know that we would be having a few new experiences of our own, as top of her list of things to do was horse riding on the beach. “You have never been horse riding?” she asked me incredulously, finding it difficult to believe I had never ridden one before. 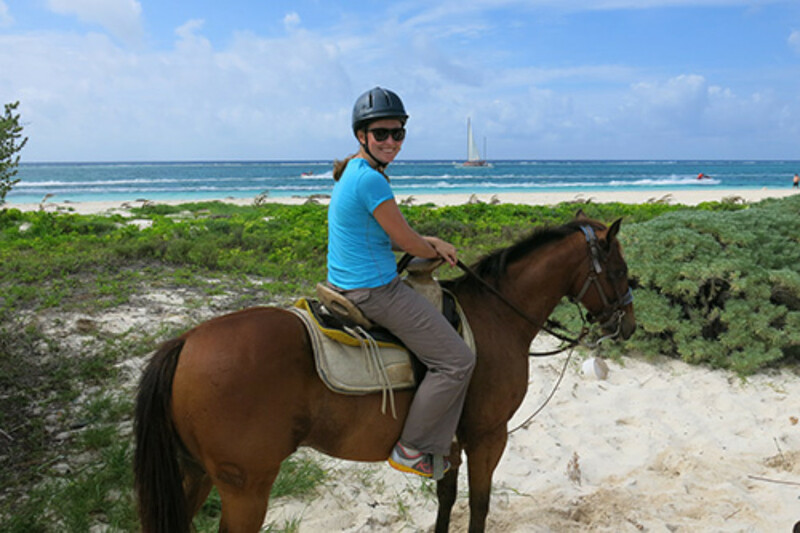 “Well, my friend had a horse when I was a kid, and she led me around the stable yard once, but I don’t think that counts,” I replied, slightly embarrassed that in all my adventures in Playa del Carmen and beyond, I had never actually ridden a horse. The truth was, like all new experiences, I was slightly afraid of the unknown, and whilst I did enjoy the company of horses and certainly appreciated them, I’d just never considered myself enough of an ‘animal person’ to be able to ride one. But all that was about to change as we headed north along the highway from Playa del Carmen toward Rancho Baaxal, the place my sister-in-law had chosen for our horse riding adventure. She chose that particular ranch due to the ethical nature of their business. The horses at Rancho Baaxal are all rescue horses, some of who have been abused and mis-treated in the past. They now have a safe haven in the jungle of the Riviera Maya, being cared for and loved by the owners of the ranch. Arriving at the gates of Rancho Baaxal, we were greeted by Steffi, one of the friendly staff, whose love for the creatures we were about to ride was immediately evident. She sat us down and asked us to fill in a questionnaire about our weight (yes, there is a restriction! ), height, and experience levels. I told her I was an absolute beginner and slightly nervous about riding, so she matched me to ‘Indio’ a timid male horse. We met our two guides for the ride, and before long, we were off! We carved a path through the jungle in single file, the horses following patiently after each other along their familiar route. It was a warm day, but the trees provided much needed shade from the sun’s rays as we meandered peacefully through the thick foliage. The two dogs from the ranch had the most fun, however, darting in and out of the jungle and winding in between the horses who seemed completely oblivious to them. When we broke through the jungle and onto the shore of a deserted beach, the dogs took straight to the water for their daily swim, while we followed our guide along the sandy beach track. “This is so much fun!” My sister-in-law cried, absolutely in her element riding a horse along the Caribbean coastline. I agreed, and even said ‘yes’ when the guides asked us if we wanted to gallop! Holding on for dear life, Indio burned some energy along the beach, kicking up a cloud of soft white sand in his wake. It was truly a magical morning, unlike anything I’d ever experienced, and I was certainly glad I had agreed to try something new. Horse riding is a relaxing and fun activity, even for beginners like me, and riding through dense jungle and along the shore of the Caribbean was a unique adventure I’ll never forget. *Contact the concierge at condo hotels to arrange your visit!